A researcher at the University of Alberta has discovered two super-salty lakes half a kilometre under the ice in the Canadian High Arctic — a finding she says could help in the search for extraterrestrial life. “So far, wherever we’ve looked where there is water underneath ice, there has been life,” says Anja Rutishauser, a PhD student at the U of A and the lead author of a paper on the discovery, published last month in the journal Science Advances. “Subglacial aquatic environments have actually been shown to host active microbial life despite their isolation from the atmosphere and their extremely dark and cold conditions,” she adds, making them good terrestrial analogues for planetary bodies and moons with similar environments. But what makes Rutishauser’s discovery so unique is that unlike most of the 400 other known subglacial lakes around the world, the Devon Lakes — named for the Devon Ice Cap beneath which they sit — are thought to contain salty water instead of fresh. Only a handful of previously discovered subglacial lakes are salty, but even among them these two are unique. While others, like the Taylor Glacier in Antarctica, typically have some sort of “brine-rich subglacial water system” or ocean stream feeding into them, the Devon Lakes are likely completely isolated from other water sources. Their salty-yet-isolated nature makes them good analogues for the hypersaline “global ocean” that is thought to sit under the icy sheet of Jupiter’s moon, Europa. Thanks to NASA’s Voyageur 1 and Voyageur 2 missions in the late 70s, scientists have suspected for decades that Europa’s combination of water, energy, and organic chemicals could support life. The Devon Lakes discovery coincides with NASA’s upcoming Europa Clipper mission. A specialized spacecraft will be launched in the early 2020s, and will reach Jupiter several years later. It will then complete 40 to 45 flybys of Europa, during which the spacecraft will capture high-resolution images of the moon’s icy surface and investigate its composition and the structure of its interior and shell. This month, Rutishauser and the Devon Lakes research team will return to the Canadian High Arctic with the support of Canada’s W. Garfield Weston Foundation. 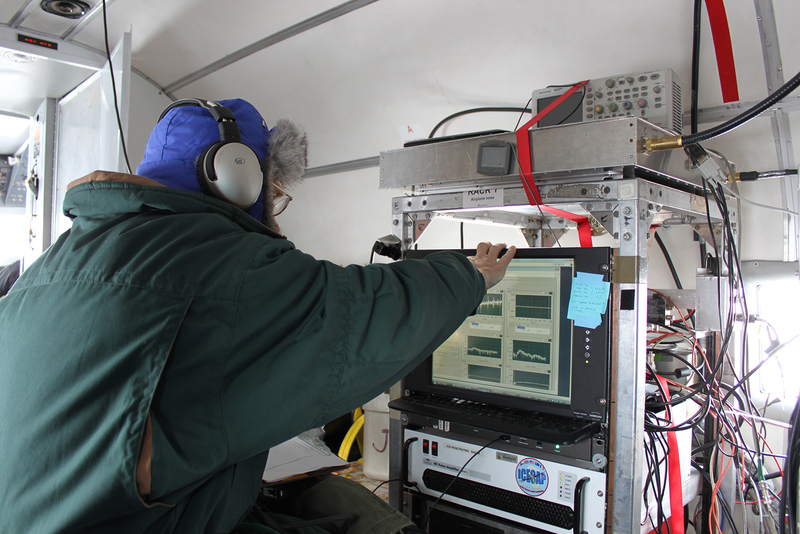 The team plans to complete an airborne geophysical survey of the Devon Ice Caps, before returning again in the future for physical samples of the water. Donald Blankenship, a scientist at the University of Texas Institute for Geophysics (UTIG) and co-author of the study says both the airborne survey and the eventual water sampling will help scientists better prepare for the Europa Clipper mission. Blankenship is leading the development of the ice-penetrating radar for the mission, which will be very similar to the ice-penetrating radar used to collect the data Rutishauser originally studied. The research team currently includes Rutishauser and members of UTIG, Montana State University, Stanford University, and the Cambridge University Scott Polar Research Institute, all of whom will be involved with the next steps. “It's amazing how the trilateral collaboration between Canadian, U.S. and U.K. universities to understand ice cap response to climate change evolved into a paradigm shift in our perspective on potential terrestrial analogs for extraterrestrial habitats,” Blankenship says.